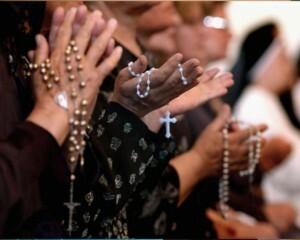 “In Iraq there are fewer and fewer Christians. The persistent violence, fear, lack of work opportunities and the issue of safety for life and limb are forcing us to leave our country, our homes and our families,” Msgr. Shlemon Warduni reported directly on the tragedy which seems never ending. “The future for Christians in Iraq, and this also holds true for the whole of the Middle East, looks very bleak and one could even think there was a plan for the ethnic cleansing of Christians.” With this Auxiliary Bishop Shlemon Warduni (70) from Baghdad, of the Chaldean Patriarchate of Babylon, described in a single sentence the grim situation the Christians in his country and the region as a whole find themselves in. At the invitation of the pontifical foundation Aid to the Church in Need, Shlemon Warduni delivered a talk last week in Portugal in the “Igreja do Sacramento” church in Lisbon and reminded his listeners of how much violence and intolerance the Christian communities in Iraq had had to suffer in the past few years.